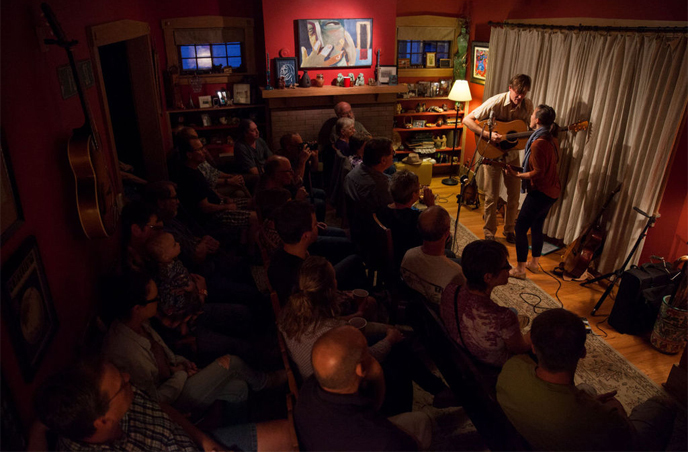 FolkHouse is a house concert series founded in May, 2000. We offer music lovers an opportunity to experience live intimate concerts by top-notch professional touring musicians in a comfortable and friendly "listening room" environment. No clanking bar glasses, noisy espresso machines or other distractions; just a comfortable smoke-free setting where the guests can focus on the music! And maybe best of all, there are plenty of opportunities to socialize with the performers and other music fans at FolkHouse. We are all about sharing great music with music loving friends! Check out FolkHouse on YouTube! Concerts from the Lincoln Journal Star! Since the concerts are actually in our home, seating is limited. To get on our email list, get concert information or receive an invitation, email to folkhouse@cox.net. Unfortunately, we are not wheelchair accessible, this is our private residence, but if a person with disabilities would like to attend a concert, we will do all we can to accommodate. IN THE HOME OF JEROME BRICH & MARY MONTAG. AND DETAILED INFORMATION ABOUT FOLKHOUSE? THE FOLKHOUSE EMAIL NEWSLETTER LIST! Copyright © 2001 by FolkHouse/JMB All rights reserved. Revised: 07 Apr 2019 15:18:23 -0500 .